Until the 80’s, the Embarcadero Freeway was a two story barrier between the city and the sea, where the spatial priority was given to the cars. Today, this is a ground floor highway combined with hard pedestrian lanes and small, unconnected green zones. The relation between people and the natural landscape has been enhanced. Nevertheless, cars still occupy a dominant position over the public space. The BaBH is the new opportunity to keep developing urban politics that bring together people, the city and the natural landscape. 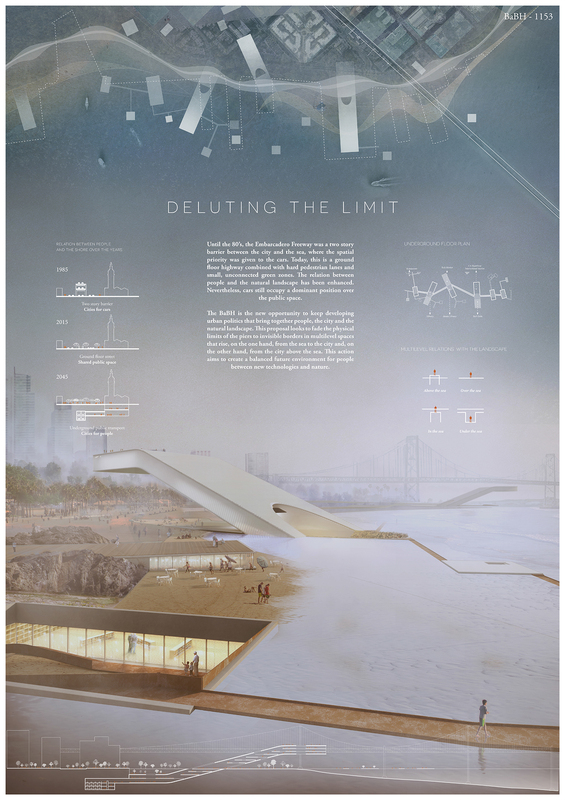 This proposal looks to fade the physical limits of the piers to invisible borders in multilevel spaces that rise, on the one hand, from the sea to the city and, on the other hand, from the city above the sea. This action aims to create a balanced future environment for people between new technologies and nature. Felicitaciones, un gran logro de espacio público!